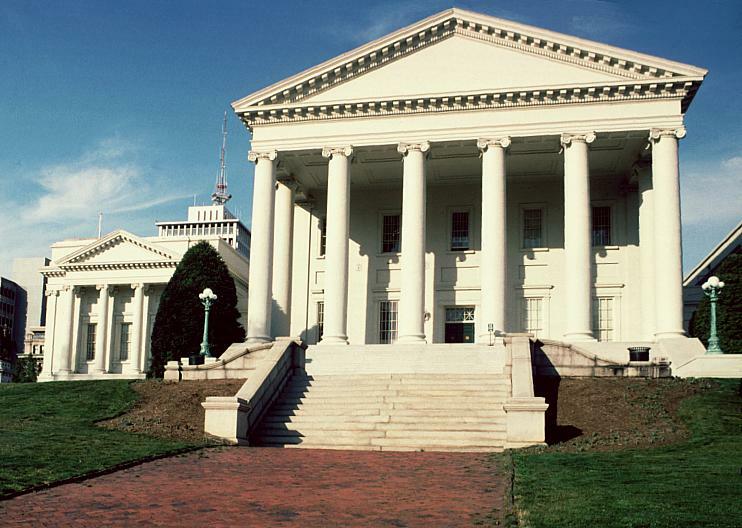 Richmond remained the capitol of the state of Virginia after the American Revolution. 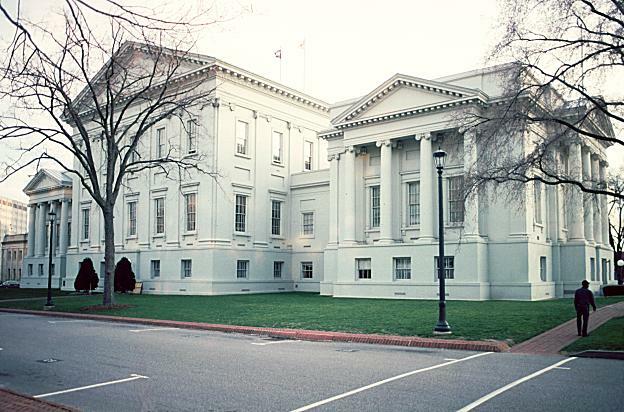 With the aid of French draftsman, antiquary, and decorator Charles-Louis Clérisseau, Jefferson designed this Neoclassical building (the central structure) as one of the first state capitols in the new Republic. 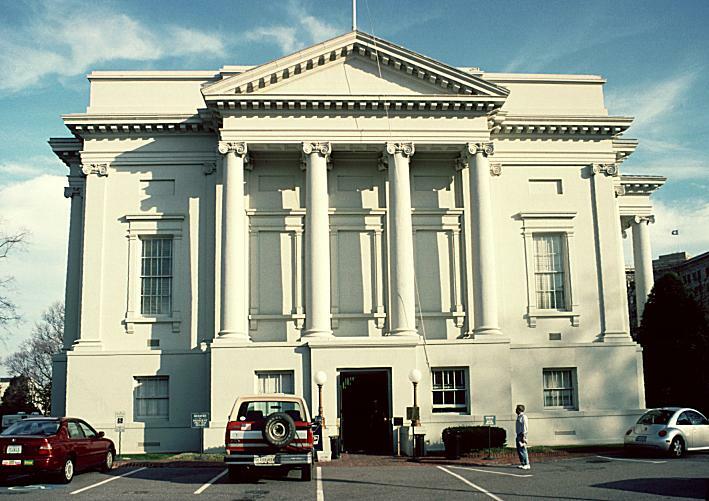 This building, for Jefferson, represented a dramatic departure from British influence (symbolized for him in the buildings of Williamsburg). 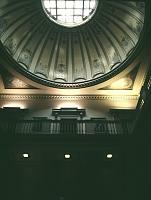 In Jefferson's "Account of the Capitol in Virginia," he explains that the temple form derives from "the Temples of Erectheus at Athens, of Balbec, and of the Maison quarrée....All of which are nearly of the same form and proportions, and are considered as the most perfect examples of cubic architecture, ad the Pantheon of Rome is of the spherical" (quoted in Brownell et al 214). 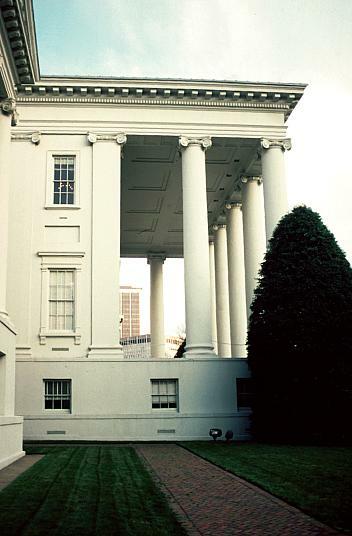 Of these, the only structure Jefferson actually saw was the Maison Carrée at Nîmes in the south of France. 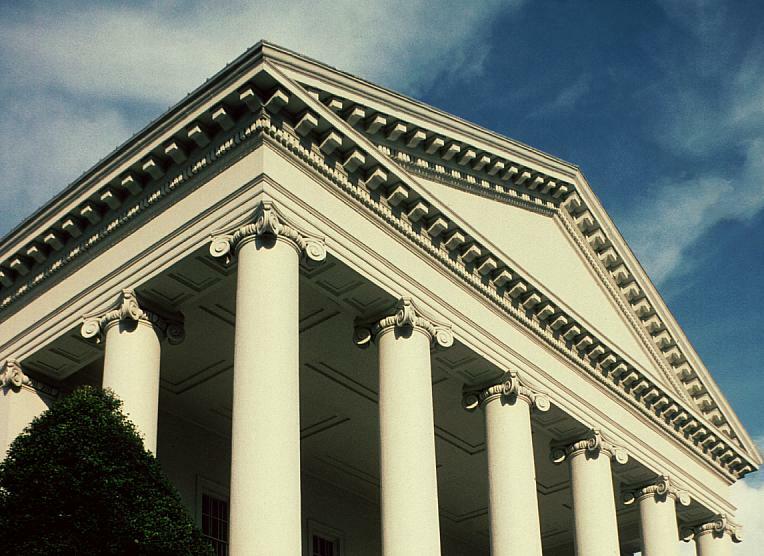 It is not clear what Jefferson meant by "cubic architecture," but he set a precedent by using a temple form for an important secular building. 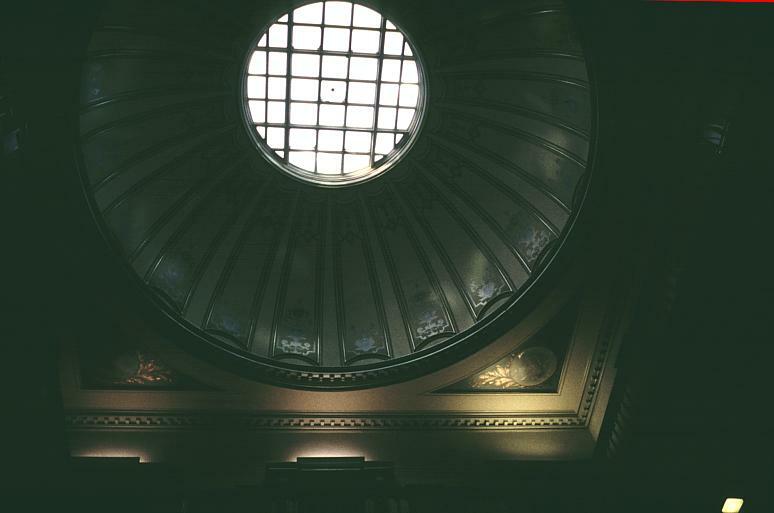 Like his Monticello, this capitol building has a commanding and impressive site. 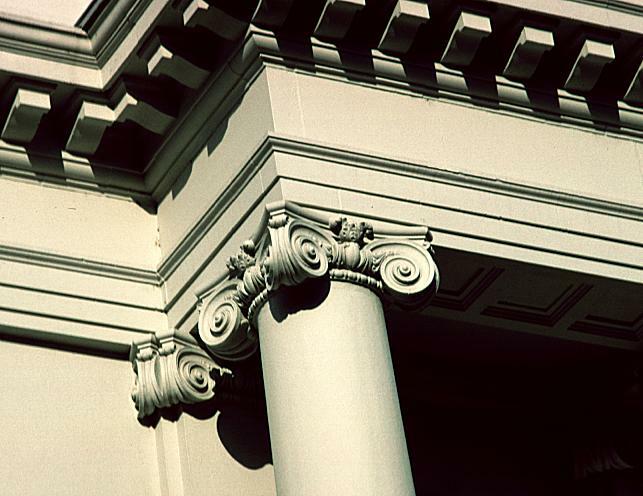 The temple form has Ionic capitals and unfluted columns. 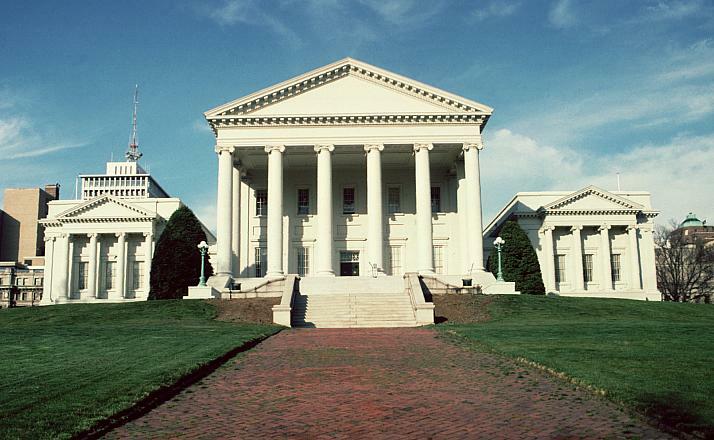 According to Jefferson, he yielded to the wishes of Clérisseau in using the "modern" Ionic capitol, a variant designed by Palladio's pupil Scamozzi. In this variant the scrolls are on the diagonal with four identical faces in between, unlike the ancient versions with the "corner" problem. 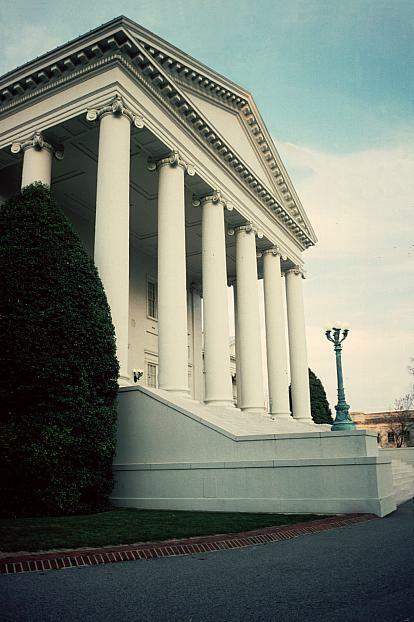 For a contrasting Ionic capital, see Strickland's later Tennessee State Capitol. 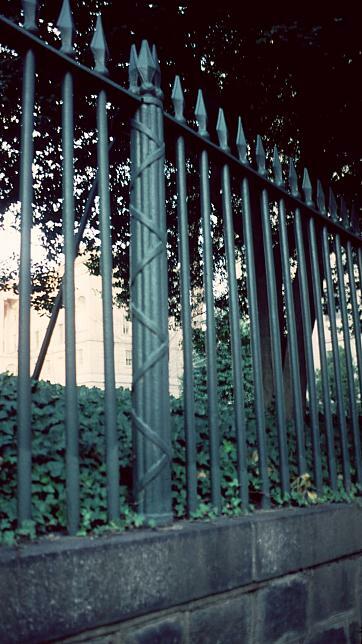 Note the main posts with the fasces, a bundle of rods tied around the shaft of an axe, which had been used by the ancient Romans to symbolize unity and civic authority. 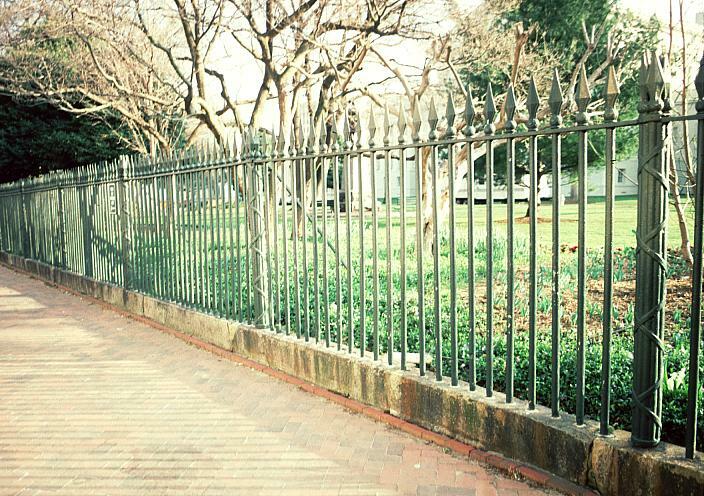 In the late nineteenth and early twentieth centuries in the United State many states built new or expanded capitols. After a number of appeals for funds and various proposals and controversies, this addition was begun in 1904. Richard Guy Wilson explains, " The wings, linked by hyphens, were kept lower and subservient to the original structure. An Ionic order of engaged columns and pediments and a high podium echoed the main building. . . .On the exterior the broad steps were built" (Brownell et al 330). 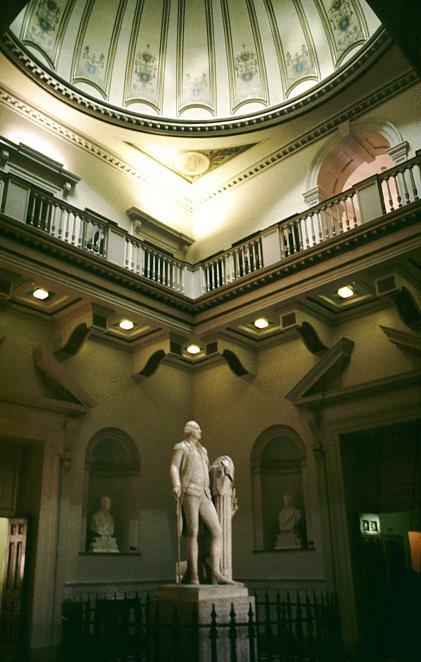 See Houdon's statue of George Washington in the Rotunda of the Capitol building. See the equestrian statue of George Washington in Capitol Square. Work Cited: Charles E. Brownell et al. 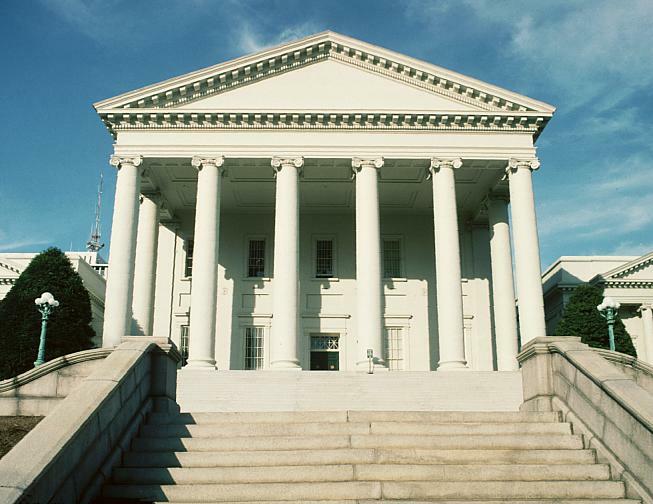 The Making of Virginia Architecture. 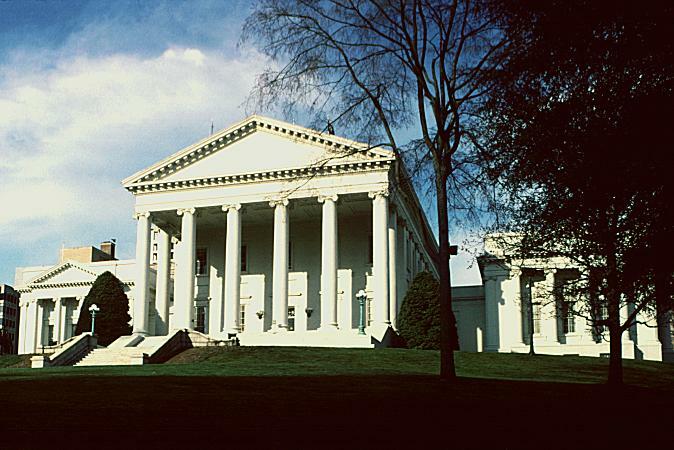 Richmond: Virginia Museum of Fine Arts, 1992. 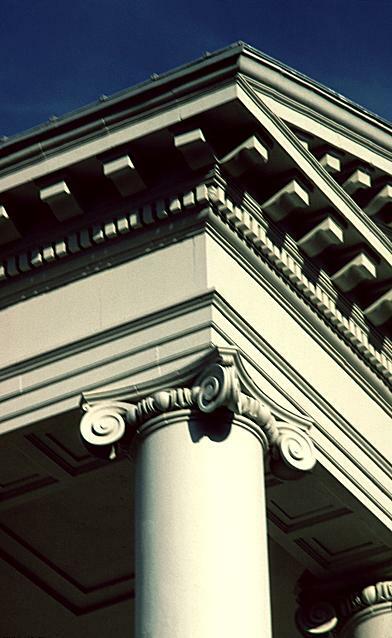 Go to Thomas Jefferson Architecture Index. © 2002 Mary Ann Sullivan. I have photographed (on site), scanned, and manipulated all the images on these pages. Please feel free to use them for personal or educational purposes. They are not available for commercial purposes.